Until as recently as ten years ago, cost was a major discriminator affecting the choice of technology (Hülsmann, 2000, 2003; Rumble, 2001; Bates, 2005). For instance, for educational purposes, audio (lectures, radio, audio-cassettes) was far cheaper than print, which in turn was far cheaper than most forms of computer-based learning, which in turn was far cheaper than video (television, cassettes or video-conferencing). All these media were usually seen as either added costs to regular teaching, or too expensive to use to replace face-to-face teaching, except for purely distance education on a fairly large scale. increasing amounts of media-based open educational resources, which are already developed learning materials that are free for teachers and students alike to use. The good news then is that in general, and in principle, cost should no longer be an automatic discriminator in the choice of media. If you are happy to accept this statement at face value, than you can skip the rest of this chapter. Choose the mix of media that best meets your teaching needs, and don’t worry about which medium is likely to cost more. Indeed, a good case could be made that it would now be cheaper to replace face-to-face teaching with purely online learning, if cost was the only consideration. In practice however costs can vary enormously both between and within media, depending once again on context and design. Since the main cost from a teacher’s perspective is their time, it is important to know what are the ‘drivers’ of cost, that is, what factors are associated with increased costs, depending on the context and the medium being used. These factors are less influenced by new technological developments, and can therefore be seen as ‘foundational’ principles when considering the costs of educational media. Unfortunately there are many different factors that can influence the actual cost of using media in education, which makes a detailed discussion of costs very complex (for a more detailed treatment, see Bates and Sangrà, 2011). As a result, I will try to identify the main cost drivers, then provide a table that provides a simplified guide to how these factors influence the costs of different media, including face-to-face teaching. This guide again should be considered as a heuristic device. So see this section as Media Costs 101.
probably the cost of an instructional designer in terms of their time. Development costs are usually fixed or ‘once only’ and are independent of the number of students. Once media are developed, they are usually scalable, in that once produced, they can be used by any number of learners without increased development costs. Using open educational resources can greatly reduce media development costs. This includes the cost of the educational activities needed during offering the course and would include instructional time spent interacting with students, instructional time spent on marking assignments, and would include the time of other staff supporting delivery, such as teaching assistants, adjuncts for additional sections and instructional designers and technical support staff. Because of the cost of human factors such as instructional time and technical support needed in media-based teaching, delivery costs tend to increase as student numbers increase, and also have to be repeated each time the course is on offer. In other words, they are recurrent. However, increasingly with Internet-based delivery, there is usually a zero direct technology cost in delivery. Once materials for a course are created, they need to be maintained. Urls go dead, set readings may go out of print or expire, and more importantly new developments in the subject area may need to be accommodated. Thus once a course is offered, there are ongoing maintenance costs. Instructional designers and/or media professionals can manage some of the maintenance, but nevertheless teachers or instructors will need to be involved with decisions about content replacement or updating. Maintenance is not usually a major time consumer for a single course, but if an instructor is involved in the design and production of several online courses, maintenance time can build to a significant amount. 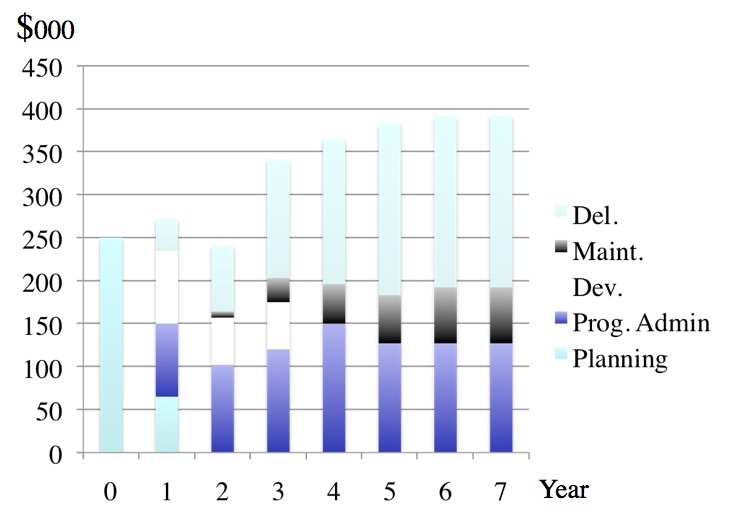 Maintenance costs are usually independent of the number of students, but are dependent on the number of courses an instructor is responsible for, and are recurrent each year. These include infrastructure or overhead costs, such as the cost of licensing a learning management system, lecture capture technology and servers for video steaming. These are real costs but not ones that can be allocated to a single course but will be shared across a number of courses. Overheads are usually considered to be institutional costs and, although important, probably will not influence a teacher’s decision about which media to use, provided these services are already in place and the institution does not directly charge for such services. whether the instructor develops materials alone (self-development) or works with professionals. Production of technology-based materials such as a video program, or a Web site, is a fixed cost, in that it is not influenced by how many students take the course. However, production costs can vary depending on the design of the course. 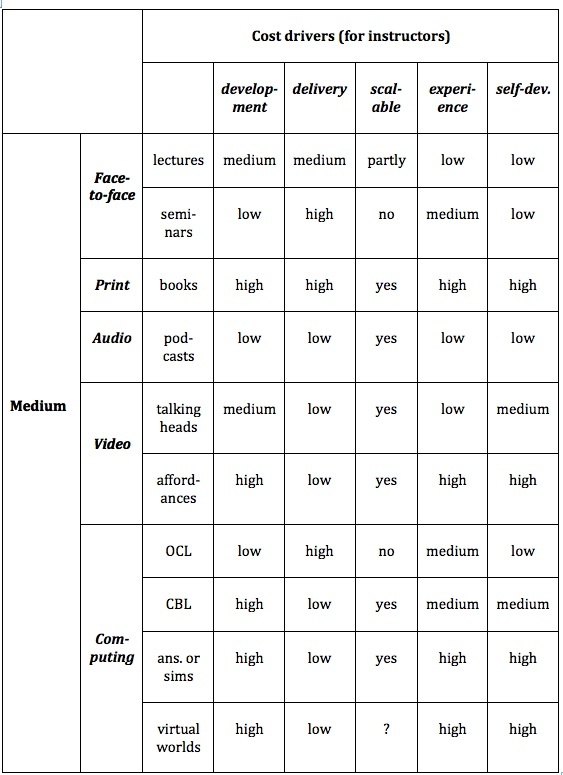 Engle (2014) showed that depending on the method of video production, the development costs for a MOOC could vary by a factor of six (the most expensive production method – full studio production – being six times that of an instructor self-recording on a laptop). Nevertheless, once produced, the cost is independent of the number of students. Thus the more expensive the course to develop, the greater the need to increase student numbers to reduce the average cost per student. (Or put another way, the greater the number of students, the more reason to ensure that high quality production is used, whatever the medium). In the case of MOOCs (which tend to be almost twice as expensive to develop as an online course for credit using a learning management system – University of Ottawa, 2013) the number of learners is so great that the average cost per student is very small. Thus there are opportunities for economies of scale from the development of digital material, provided that student course enrolments can be increased (which may not always be the case). This can be described as the potential for the scalability of a medium. Similarly, there are costs in teaching the course once the course is developed. These tend to be variable costs, in that they increase as class size increases. If student-teacher interaction, through online discussion forums and assignment marking, is to be kept to a manageable level, then the teacher-student ratio needs to be kept relatively low (for instance, between 1:25 to 1:40, depending on the subject area and the level of the course). The more students, the more time a teacher will need to spend on delivery, or additional contract instructors will need to be hired. Either way, increased student numbers generally will lead to increased costs. MOOCs are an exception. Their main value proposition is that they do not provide direct learner support, so have zero delivery costs. However, this is probably the reason why such a small proportion of participants successfully complete MOOCs. There may be benefits then for a teacher or for an institution in spending more money up front for interactive learning materials if this leads to less demand for teacher-student interaction. For instance, a mathematics course might be able to use automated testing and feedback and simulations and diagrams, and pre-designed answers to frequently asked questions, with less or even no time spent on individual assignment marking or communication with the teacher. In this case it may be possible to manage teacher-student ratios as high as 1:200 or more, without significant loss of quality. Also, experience in using or working with a particular medium or delivery method is also important. The first time an instructor uses a particular medium such as podcasting, it takes much longer than subsequent productions or offerings. Some media or technologies though need much more effort to learn to use than others. Thus a related cost driver is whether the instructor works alone (self-development) or works with media professionals. Self-developing materials will usually take longer for an instructor than working with professionals. There are advantages in teachers and instructors working with media professionals when developing digital media. Media professionals will ensure the development of a quality product, and above all can save teachers or instructors considerable time, for instance through the choice of appropriate software, editing, and storage and streaming of digital materials. Instructional designers can help in suggesting appropriate applications of different media for different learning outcomes. Thus as with all educational design, a team approach is likely to be more effective, and working with other professionals will help control the time teachers and instructors spend on media development. Lastly, design decisions are critical. Costs are driven by design decisions within a medium. For instance cost drivers are different between lectures and seminars (or lab classes) in face-to-face teaching. Similarly, video can be used just to record talking heads, as in lecture capture, or can be used to exploit the affordances of the medium (see Chapter 7), such as demonstrating processes or location shooting. Computing has a wide and increasing range of possible designs, including online collaborative learning (OCL), computer-based learning, animations, simulations or virtual worlds. Social media are another group of media that also need to be considered. Figure 8.4.2 attempts to capture the complexity of cost factors, focusing mainly on the perspective of a teacher or instructor making decisions. Again, this should be seen as a heuristic device, a way of thinking about the issue. Other factors could be added (such as social media, or maintenance of materials). I have given my own personal ratings for each cell, based on my experience. I have taken conventional teaching as a medium or ‘average’ cost, then ranked cells as to whether there is a higher or lower cost factor for the particular medium. Other readers may well rate the cells differently. Although the time it takes to develop and deliver learning using different technologies is likely to influence an instructor’s decision about what technology to use, it is not a simple equation. For instance, developing a good quality online course using a mix of video and text materials may take much more of the instructor’s time to prepare than if the course was offered through classroom teaching. However, the online course may take less time in delivery over several years, because students may be spending more time on task online, and less time in direct interaction with the instructor. Once again, we see that design is a critical factor in how costs are assessed. In short, from an instructor perspective, time is the critical cost factor. Technologies that take a lot of time to use are less likely to be used than those that are easy to use and thus save time. But once again design decisions can greatly affect how much time teachers or instructors need to spend on any medium, and the ability of teachers and students to create their own educational media is becoming an increasingly important factor. In recent years, university faculty have generally gravitated more to lecture capture for online course delivery, particularly in institutions where online or distance learning is relatively new, because it is ‘simpler’ to do than redesign and create mainly text based materials in learning management systems. Lecture capture also more closely resembles the traditional classroom method. Pedagogically though (depending on the subject area) it may be less effective than an online course using collaborative learning and online discussion forums. Also, from an institutional perspective lecture capture has a much higher technology cost than a learning management system. Also, students themselves can now use their own devices to create multimedia materials for project work or for assessment purposes in the form of e-portfolios. Media allow instructors, if they wish, to move a lot of the hard work in teaching and learning from themselves to the students. Media allow students to spend more time on task, and low cost, consumer media such as mobile phones or tablets enable students themselves to create media artefacts, enabling them to demonstrate their learning in concrete ways. This does not mean that instructor ‘presence’ is no longer needed when students are studying online, but it does enable a shift in where and how a teacher or instructor can spend their time in supporting learning. Activity 8.4 How will cost affect your decision about what media to use? Are concerns about the possible cost/demands on your time influencing your decisions on what media to use? If so in what ways? Has this section on costs changed your mind? How much time do you spend preparing lectures? Could that time be better spent preparing learning materials, then using the time saved from delivering lectures on interaction with students (online and/or face-to-face)? What kind of help can you get in your institution from instructional designers and media professionals for media design and development? What media decisions will the answer to this question suggest to you? For instance, if you are in a k-12 school with little or no chance for professional support, what kind of media and design decisions are you likely to make? If you were filling in the cells for Figure 8.4.2, what differences would there be with my entries? Why? In Figure 8.4.2, add the following media: e-portfolios (in computing) and add another section under computing: social media. Add blogs, wikis and cMOOCs. How would you fill in the cells for each of these for development, delivery, etc.? Are there other media you would also add? Do you agree with the statement: It would now be cheaper to replace face-to-face teaching with purely online learning, if cost was the only consideration? What are the implications for your teaching if this is really true? What considerations would still justify face-to-face teaching? 8.4 Cost by Anthony William (Tony) Bates is licensed under a Creative Commons Attribution-NonCommercial 4.0 International License, except where otherwise noted.